I'm always appreciative of discovering comics that I hadn't known existed for whatever reason, so I try to share with you all when I can. The S.O. and I recently watched the 1975 film, Friday Foster, starring Pam Grier and Yaphet Kotto. The movie was unintentionally laughable -- everything from a script that seemed to be missing every other page to random explosions for no reason to an insanely over-acted death scene by Carl Weathers to a soundtrack that sounded like it was written by a kid trying to emulate Peter Frampton. We had a laugh-riot mocking the Ruffles-eating police detective for hours after the movie ended. Anyway, it turns out that the movie was based on a comic strip of the same name! The comic strip is generally cited as the first mainstream (i.e. nationally syndicated) strip featuring a black character in the title role. (Jackie Ormes' earlier Torchy didn't get widely distributed, and Ted Shearer's Quincy didn't debut until later in 1970.) As far as I've been able to determine, though, the original strips have never been collected and/or reprinted, an oversight that I wouldn't mind seeing corrected, especially in lieu of how little information about the strip is online! I'd be in line for a reprint collection. 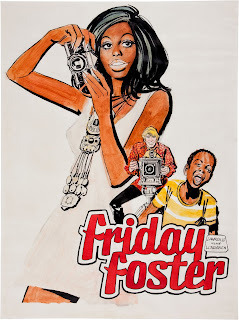 I recall reading Friday Foster when I was a kid. It was published in the New York Daily News. Also, if I recall correctly, Gray Morrow also drew some of the strips.